Camping on an island. Bundling up the Fireball, taking it on a (thankfully, brief) ferry ride to a beautiful Lake Superior island, and setting up camp for three nights. What’s not to like? 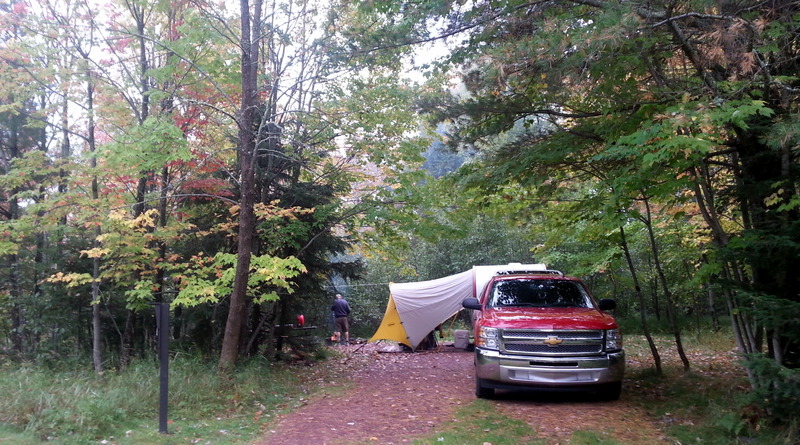 Now picture, camping in 40 degree rain for three days, complete with 20mph winds (gusting to 30 at times). Now how does that sound? The Apostle Islands are 20+ islands located off the northernmost tip of Wisconsin in Lake Superior. 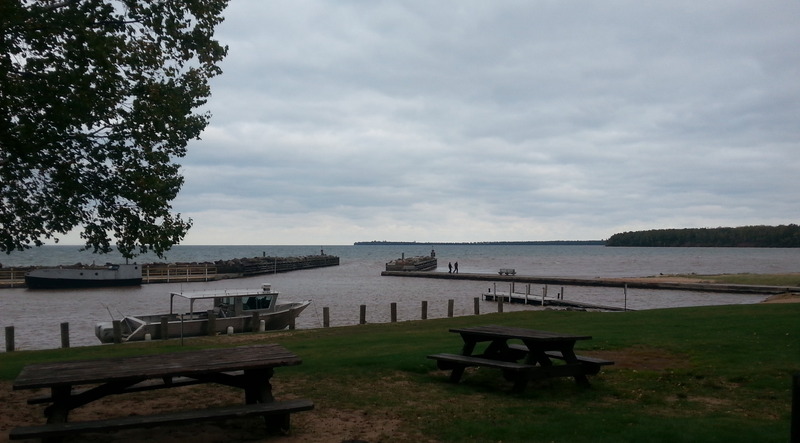 Madeline Island, the largest of them, contains Big Bay State Park, the village of LaPointe, and also a township park/campground, as well as many private residences. Our destination was the State Park. Roundtrip ferry charges were about $90 for the Fireball/Firetruck, plus the three of us. Not unreasonable. 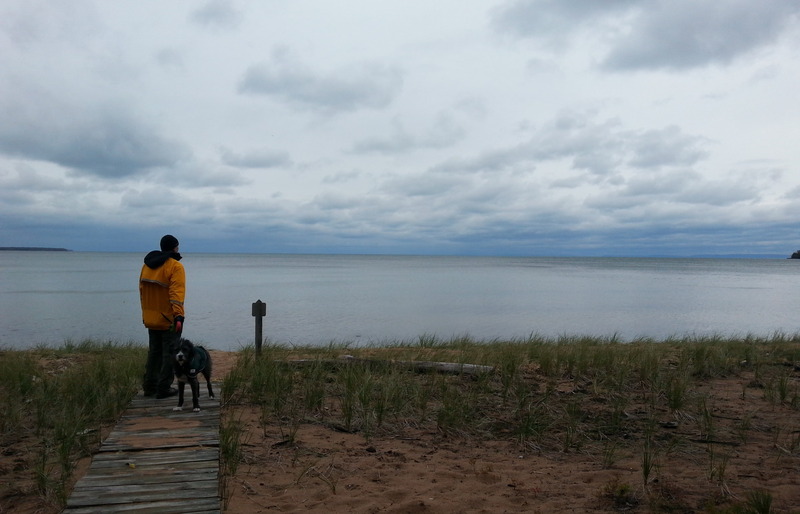 Before the deluge began, we did get a chance to explore the campground and adjoining beach. 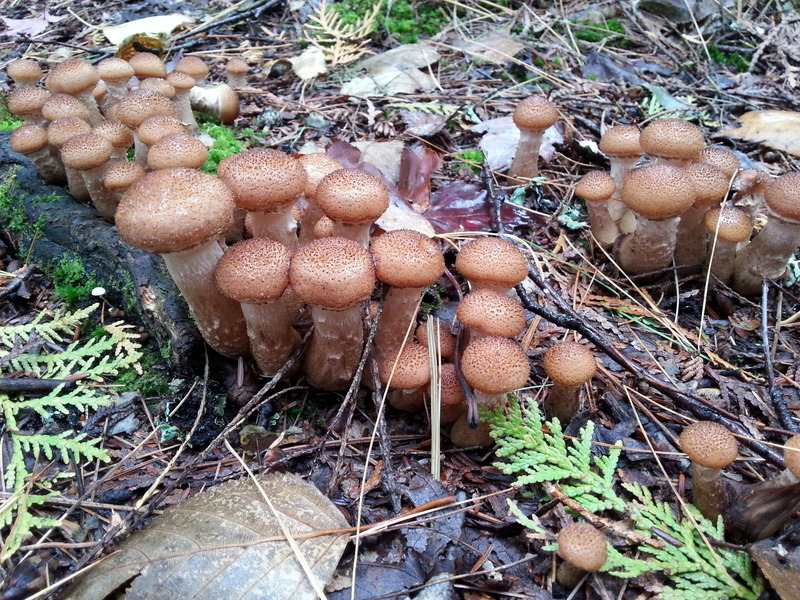 There are some fantastic sites here – large and wooded. We earmarked a few trails for exploration in the coming days. It was cold, and the wind was howling as the sun began to dip. As Jezzy and I made the last lap of her pre-dinner stroll, I noticed a bicycle loaded with panniers rolling past. “Where did you ride from?” I hollered. “Iowa!” So, we invited him over for cold beer, hot coffee, dinner, and campfire. Our new cyclist friend is Rusty Easton, a bike mechanic from Waterloo, who has cycled to work every day for over 16 years. After warming up by the roaring fire John had established, he wandered back to his own campsite, refusing our offer of dinner. Nice encounter. The first of the big rains had already begun. Back at camp, the rain begins. Thru the night. Gawd, this is SO tiresome. Towels haven’t been dry in days, floormats are caked with wet dirt, and everything is just nasty to the touch. We can’t keep a decent campfire going – when the flame is flaming, the swirling winds make enjoying the fire impossible – we have to rotate our chairs like a lazy susan. Day three is Hiking Day. Cold drizzle makes me want to leave Jezzy behind, but the pleading looks from both Jezzy and John force me to relent. Off we go on the Lagoon Ridge Trail, which apparently does not see too many sets of feet upon it. Overgrown, with deep mud in spots, it’s a real slog. 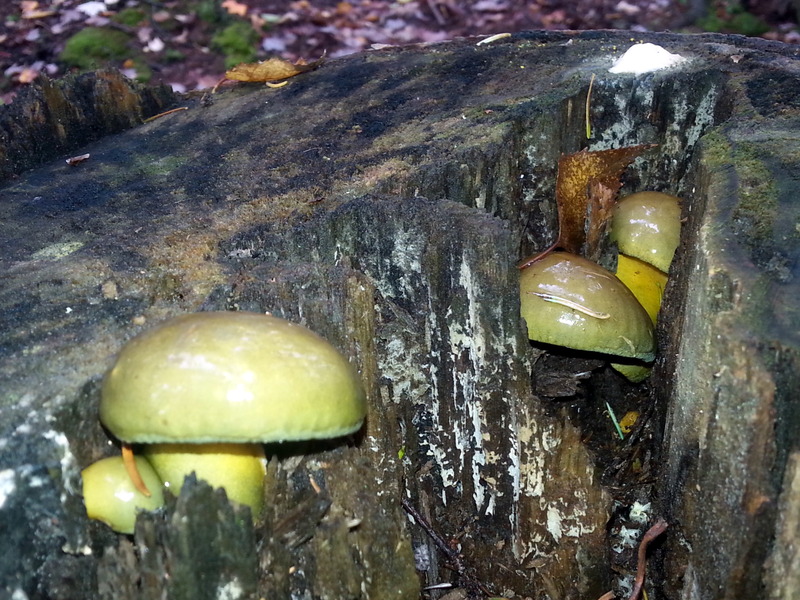 Came across these mushrooms, which were the weirdest orange-y green shiny color ever! Other mushrooms looked like a good bet for dinner. But, we do get a few nice views of the Lagoon, a large body of water, separated from the Lake by just a narrow barrier strip of land. 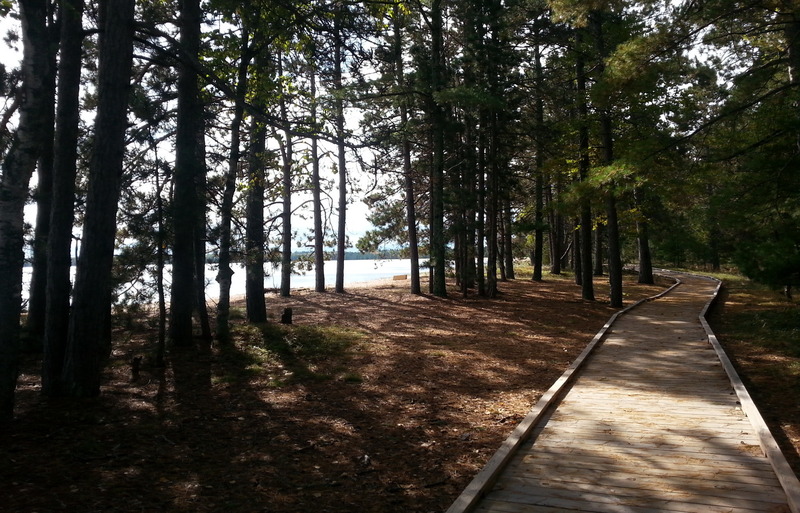 Our return hike is via a boardwalk, which runs between the two parks on the Island. It’s a pleasant stroll. We’re sorry that we don’t get to explore the other Apostle Islands. Seems like it would be an ideal place to kayak, although windy/rainy/October/Lake Superior doesn’t sound like a good time to learn. Yeah, I’ll put that on the (long) list of stuff I gotta get to. Heading out on Sunday morning, we manage to get on the 9:15 ferry. We’re pleased, because we anticipated having to wait. The entire campground was packing up on this Sunday morning, and it’s a fairly small boat. We lucked out. 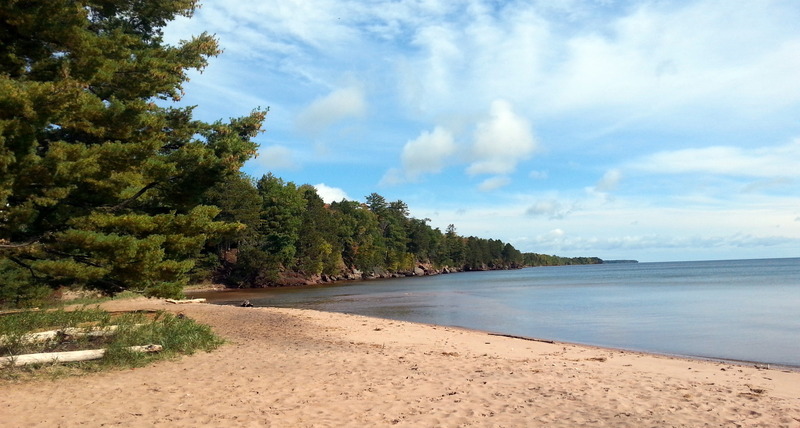 On the road to Duluth, we cut in to see part of the Apostle Island National Lakeshore at Little Sand Bay. There’s a defunct fishing operation. 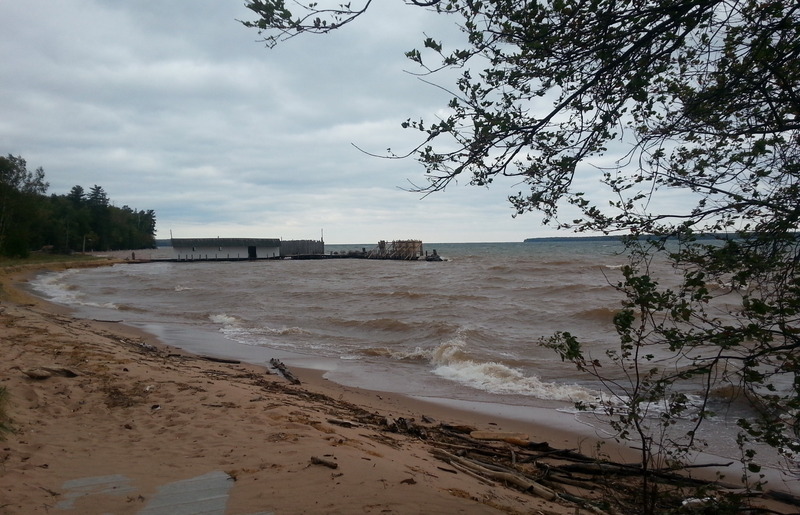 The Lake is wild – crashing up over the breakwater. It’s freezing! 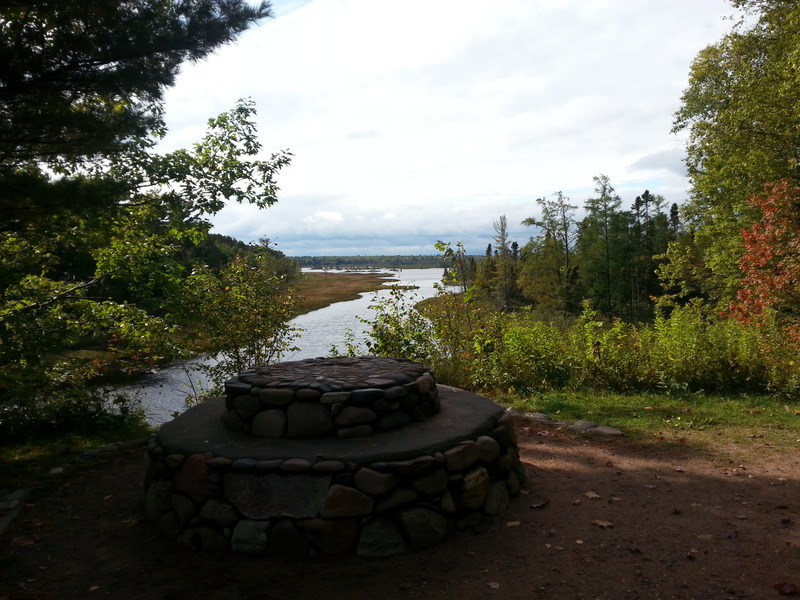 We roll into Duluth, where we have a three-night reservation at Lakehead Marina and RV Park. What a laugh! It’s no park – they should call it Lakehead Marina and Parking Lot, which perfectly describes this place. It’s awful! We decide to stick it out for at least one night, then play it by ear. When near an urban area, we like to be close to the city, to make exploration easy without getting in the truck. We’re right across the river from downtown Duluth, and the iconic bridge and drawbridge fill the view from each side of the Fireball. As I write this, we watch a large Coast Guard vessel slide beneath the raised drawbridge. in the morning. Distant freighter horns beg us to get on our bikes and see what’s happening out there. The sun is out! Maybe this will be okay. 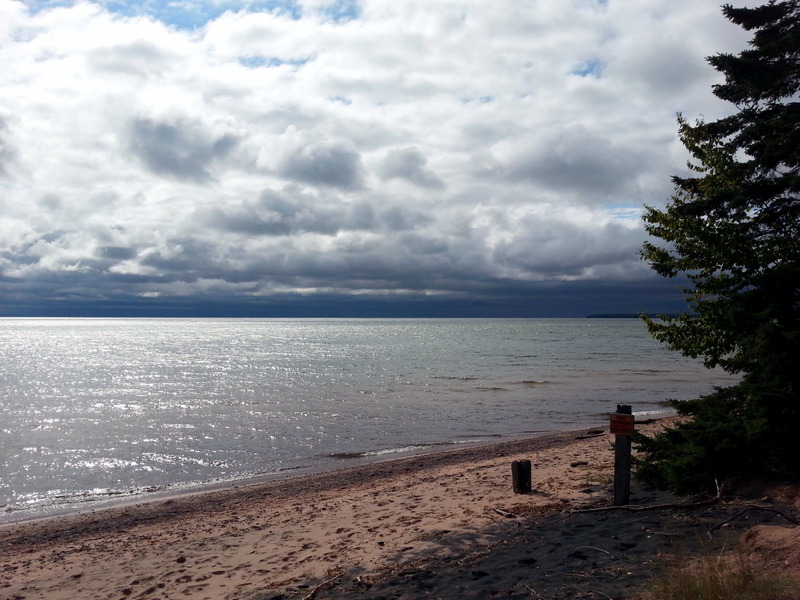 This entry was posted in camping, cycling, hiking, retirement, road trip, state parks, T@DA, Wisconsin and tagged Apostle Islands, camping, cycling, hiking, retirement, road trip, simple camping, state parks, Wisconsin by Judy Crankshaw. Bookmark the permalink. You had the weather we should have had in Oregon and Washington but didn’t! 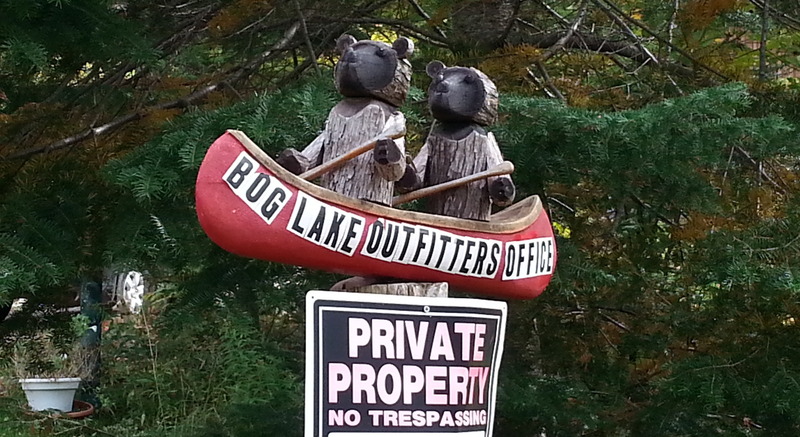 Next time you are here throw our kayaks in the truck and take them out on Blue Grass Lake or the Hovey reservoir. Good places to experiment and you might see nesting eagles. Westside Nut Clubs Fall Festival is this week, wanna a brain sandwich? We hada good run of nice weather, so we’re happy that you had good weather for your excursion. Curious as to how your choices are stacking up vs each other. What a fun decision to make. Seems like I should be able to find a decent brain sandwich around Duluth somewhere….you go ahead and eat one for me though, ok? I think that you and John would love kayaking, but Lake Superior is no place for beginners any time of the year. I’ve thought about kayaking the Apostles, but I’d need a different kayak, as mine is better suited to rivers than big open water. I hope that you get a few days of good weather to dry out, but the forecast is keeping it cold for the foreseeable future. 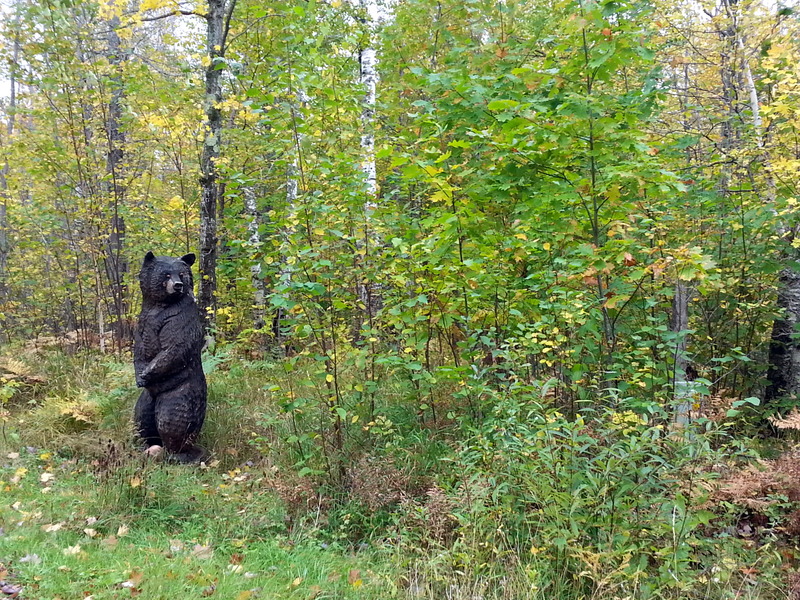 I’m looking forward to seeing what you find in the Duluth area, it’s been years since I’ve been there. Wet dog in camper is a damper. That’s all the poetry you’ll be getting from me. I would love to try kayaking, and am smart enough to know that this isn’t the spot for Kayaking 101. But, it is the spot for thinking about it. Cold is okay, if dry goes along with it. 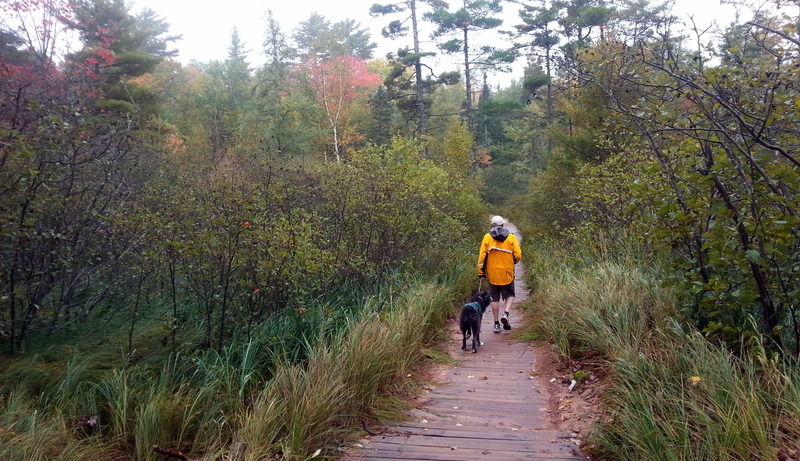 Enjoying the great outdoors, no matter what beautiful spot we’re in, is tough when its cold + wet. That’s just not any fun for us. Our spirits have improved in sunny Duluth. Thanks for the train museum recommendation. We loved it. It’s amazing what the sun and blue skies do to the mood in your pictures. Those look inviting and warm, though it’s obviously not summery there. The cloudy pictures make the scenery seem foreboding and desolate. I’m sure I’m imposing my prejudice for sunny weather, warm air, and blue skies on them. 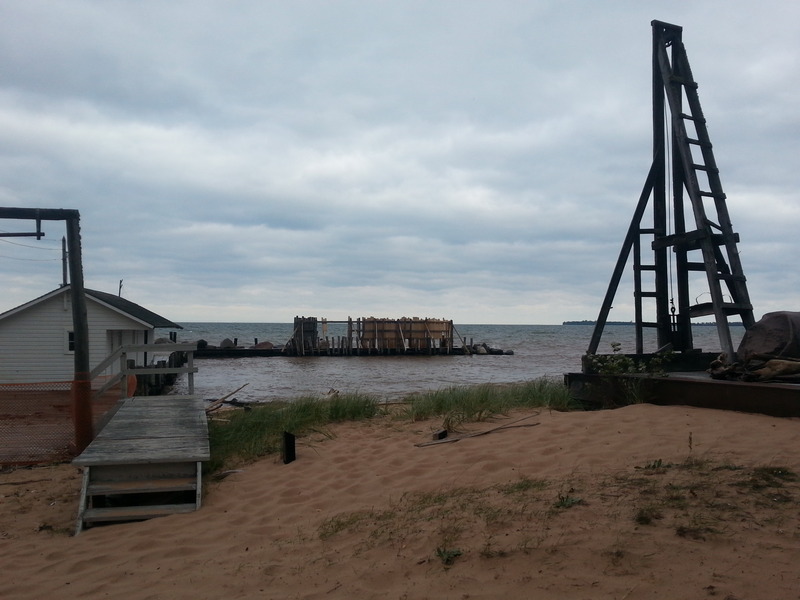 Lake Superior is sure a moody body of water. Keep warm and dry as much as you can. Will you find a place to do laundry and dry everything out? It is so gloomy when it gets dark like that. Without fail, rain has followed these dark days to find us. But, we’ve had a day of sun now, and towels are dry. Laundromat days are not the most fun ones, so we try to only go when its critical. You’d be surprised how long we can wear the same pair of jeans. Or, maybe you just shouldn’t know! We are freezing! Lots of strong winds keep us bundled up. We are holding firm though, in not turning on any heat. Not sure what we are trying to prove.. Listened to game 3 last note on radio. Such a disappointment. Wow, what a trip! I have to admit that I feel sorry for Jezzy looking at her legs in that top picture. I bet she thought it was all a hoot, though. Here’s wishing you warmer weather and clear skies! Jennifer, she’s surprisingly dainty when it comes to wet feet. Would prefer to be carried across, if possible. We can hack the cold, if mixed with a bit of sunshine. We hasn’t had much of either when I posted this. Things are looking up. I wish I could go on a trip like that. I am leaving for Reno and San Francisco tomorrow. I hope I have as much fun as you two. Reno and SF sounds terrific. Hope you catch a bit of sunshine and warm air. Enjoy the trip.